The bill also legislated new limits to using corporate interest expense as a fully deductible tax shield. 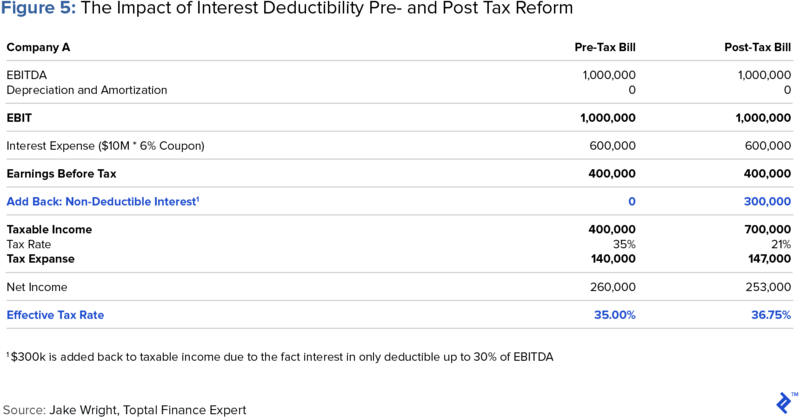 Instead, interest deductions are capped at 30% of EBITDA for the next three years, and at 30% of EBIT from 2022 onward. Though benefits will vary by industry, companies and sectors with strong aggregate operating margins and low to moderate debt to equity ratios will experience immediate gains from the new tax rate. While companies and sectors with low operating margins and moderate to high leverage may experience “adjustment pains” from the new tax bill. While there has been no change to the calculation of EBITDA under the new tax law, the ability to utilize EBITDA as a proxy for cash flow as both an operating metric and for valuation purposes is significantly diminished. Free cash flow calculations are intrinsically affected by both the new marginal tax rates and new laws around interest deductibility. On the one hand, a lower marginal tax rate increases free cash flow and thus corporate valuations, but on the other, the new rules around interest deductibility have created a spectrum of possible outcomes depending on one’s capital structure. As indicated, valuations will be affected by the widespread changes to free cash flow profiles of companies. More significant, though, is the impact of the new legislation to the calculation of weighted average cost of capital (WACC) and thus the discounted cash flow (DCF) valuation method. Specifically, as less interest becomes deductible, the cost of debt and thus WACC (i.e., discount rate) will rise, lowering valuations across corporations and projects across the landscape. How Can You Benefit from a Tax and Valuation Expert? Developing a robust, bottoms-up and dynamic financial model that identifies your company’s key drivers is the first step a valuation expert can take to assist your company make better, more holistic, data-driven operating and financial decisions. With a detailed foundational model built, different scenario analyses can be executed, modeling/layering in outer year impactions of a range of phenomena such as tax reform, a rising interest rate environment, inflation and new trade rules, or specific idiosyncracies to your industry. The next step is a forensic capital structure analysis. The valuation expert would utilize the financial model to iteratively tweak your capital structure assumptions to ensure that your company is fully optimized, debt to equity wise, for its specific corporate objectives. The final step would then be to build and perform a discounted cash flow valuation analysis using the previously built model and optimized capital structure. By combining all three exercises, a valuation expert can help you identify the key drivers of value, as well as the risks and opportunities to your business, en route to maximizing shareholder value. On December 27th, Congress passed a historic tax bill that has freed up billions of dollars in formerly taxed earnings for US corporations. Prior to this cornerstone legislation, US C-Corporations (C-Corps) had one of the highest marginal tax rates globally at 35%. The bill reduced this marginal tax rate to 21%; and for pass-through entities such as S-Corps and LLCs, increased the deduction to their income by 20%. In the period that followed, a barrage of headlines ensued speculating on how US companies might and/or should spend their newfound savings. These methods ranged from the granting of one-time bonuses to employees as with Chipotle to increasing capital expenditures as with AT&T, who pledged an increase of $1 billion for 2018. While granting raises to employees and spending more on PP&E can be considered value-adding ways to spend tax savings, the tax bill represents much more than just a tax cut. Specifically, and as will be the subject of this article, traditional interest expense deductions (tax shields) have been watered down by the bill—an aggregate change that is already creating winners and losers (per the charts below). This article seeks to explore the changes to the interest expense deductibility environment induced by the tax reform legislation, and the long term implications for the valuation methods traditionally used by corporations to assess value—methods such as the discounted cash flow (DCF) and the EBITDA multiple techniques. Over the last few decades, the US capital markets have grown accustomed to debt issuances growing in volume annually. This growth in recent times has been driven by a low interest rate environment, the ability to fully deduct interest from taxable income, and the ability to utilize debt to fund share repurchases and increase earnings per share. Though companies will continue to be able to deduct their net interest costs in 2018 under the new tax law, they will only be able to do so up to 30% of EBITDA; and as of 2022, the law becomes even more stringent, allowing the 30% ceiling to apply only to EBIT. As alluded to, these changes will transform the role debt has historically played in the capital structure of most corporations and will also have a marked effect on net income, cash flows from investing, weighted average cost of capital (WACC), and thus corporate valuations. John Graham and Young Jun Song, economists at Duke Fuqua School of Business, have explored the likely effects of the new interest deductibility environment on US corporates in 2018. They concluded that the average company will lose 41% of its interest deduction, with industries such as healthcare, pharmaceuticals, and energy being hit especially hard even with the federal statutory tax rate for corporations declining from 35% to 21%. Let’s take a look at a hypothetical company in order to better understand the impact of the new limits of interest deductibility on taxable income. Consider Company A, assuming no depreciation or amortization for simplicity, which has an EBITDA of $1 million. The company has amassed $10 million in debt outstanding, with a coupon of 6.0%. In 2017, this company would have paid taxes of $140,000 and would have had net income of $260,000, implying an effective tax rate of 35.0%. As of 2018, however, this company is now only able to deduct interest expenses of up to 30% of EBITDA, implying a cap of $300,000. This same company will now pay taxes of $147,000, resulting in net income of $253,000, or an effective tax rate of 36.75%. As illustrated in Figure 5, Company A’s EBITDA remained the same both pre- the tax bill and post-; however, the company’s effective tax rate increased, dropping its net income. This effect/phenomenon, induced by the new interest deductibility limits, has created new problems for the efficacy of EBITDA as a proxy for cash flow, and thus for the EBITDA multiple valuation methodology expounded upon below. For years, corporate and finance professionals have utilized variations of the EBITDA multiple methodology (technically termed “the market approach”) as a legitimate method for valuing businesses. The most prevalent of these variations has long been the total enterprise value to EBITDA multiple (TEV/EBITDA) approach, in which one applies the TEV/EBITDA multiple from a comparable publicly traded company (“trading comps” approach) or a recently purchased comparable company (“transaction comps” approach) to the EBITDA of the company at hand to approximate its total enterprise value. As previously alluded to, the reasons for the widespread adoption of the TEV/EBITDA multiple method is that EBITDA has been long considered a strong proxy for cash flow, the theory of which is explored in depth by Toptal Finance Expert, Puneet Gandhi, in a thought-provoking piece entitled, Should We Rethink the Use of EBITDA?. However, with the newly legislated inability to deduct 100% of interest expense, EBITDA will begin to exhibit far greater variability, as an apples-to-apples comparison between companies, where both operating cash flows and net income are concerned. The variability between EBITDA and free cash flow will be the largest for firms with low operating margins or that are highly-levered. The driver of the variability is that with the 30% of EBITDA limit on interest deductibility at play, where EBITDA comes close to being insufficient to cover all of your interest expense, net income and free cash flow drop disproportionately due to the inability to deduct all of the interest. Conversely, where leverage is low enough or EBITDA high enough, whereby it sufficiently covers all interest expense even assuming the 30% deduction cap, net income and free cash flow benefit disproportionately because one can now deduct all the interest. A slightly tangential but nonetheless relevant interruption to this conversation is that free cash flow itself is also affected by the new tax laws. There exists a long-standing debate over whether the marginal tax rate or the effective tax rate is the right rate to use in deriving a company’s free cash flow. Going back to our hypothetical Company A for purposes of illustration, the decision is between using its effective rate of 36.7% or the marginal rate of 21.0% to derive FCF; a difference in outcome which becomes material as the debt quantum taken out by a given company rises. The effective tax rate, while reflecting the actual dollars paid by the company in tax, is a flawed choice given the substantial swings possible year-to-year in the earnings that companies report on its books vs. those they show on their returns. As such, I am of the opinion that the marginal tax rate will continue to be the prudent choice for corporate managers and investment professionals alike. The result will undoubtedly be increased levels of free cash flow which will benefit companies not just from a valuation perspective but also from a discretionary cash perspective—cash which may be used to amend dividend or distribution policies, growth capital investment decisions, mergers and acquisitions, and general capital structuring. More likely than not, corporate and investment professionals will continue to use EV/EBITDA as one of our go-to methods for valuing businesses. We must do so, however, only with a healthy appreciation for the complexities/nuances to continuing to use EBITDA as a proxy for cash-flow in this new environment. 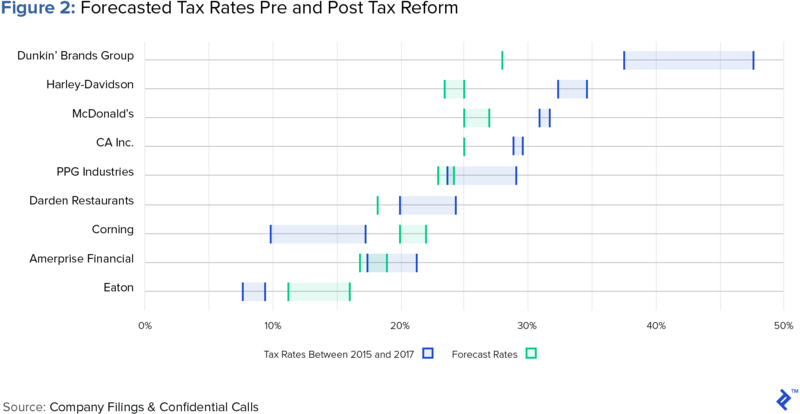 Given the drop in the marginal tax rate from 35% to 21%, free cash flow will feel overstated relative to prior years and thus, valuations will benefit from an artificial boost in the short term. Just as operating cash flow and net income are affected by the new tax law, so too is weighted average cost of capital (WACC) and free cash flow (FCF). Free cash flow is defined as the amount of cash a company generates after accounting for all capital expenditures, debt paydown, interest payments, working capital drains, taxes, and dividends. Thus, as a given company’s tax burden falls, its free cash flow rises commensurately. The WACC, on the other hand, is a calculation of a firm’s cost of capital in which both the cost of debt and cost of equity capital is weighted in proportion to their representation in a given company’s capital structure. Conceptually, the WACC reflects the intrinsic risk borne by an investment and the time value of money used to discount FCF back to present value. The tax rate is a key input for both the cost of equity and the cost of debt in the WACC calculation. The cost of debt is impacted by the amount of interest that is deductible, and the cost of equity is affected by either the choice of beta (determined in part by the company’s tax bracket) or in the unlevering and relevering process for a chosen beta. All things being equal, a lower tax rate results in a higher after-tax cost of debt and a higher re-levered beta, the latter of which results in a higher cost of equity. Let’s revisit Company A to better understand the impact of the tax bill on the cost of debt and a company’s WACC. Prior to 2018, if a company had $10 million in debt with a coupon of 6.0% and a 35.0% marginal tax rate, its after-tax cost of debt would have been 3.9%. The company could deduct all of its interest, thereby making this calculation a simple one. In today’s tax environment, the calculation has become far more complex. Let’s assume that the company still has $10 million in debt, a coupon of 6.0%, a new marginal tax rate of 21.0%, and EBITDA of $1 million. Assuming these figures, only $300,000 of the $600,000 of interest expense is deductible, with the remaining $300,000 fully taxable; thus implying an after-tax cost of debt of 5.4%. The above case study demonstrates how, without any structural changes to a given company’s earnings or debt load, the new tax regime increases cost of debt in limiting the ability to fully deduct interest. This implies a higher weighted average cost of capital that in turn lowers company and project valuations, and thus affects how corporates, investors, and portfolio managers assess projects and companies going forward. Though there is some cause for concern, these portfolio managers, investment professionals, and corporate managers need not accept lower valuations due to the new tax bill. Assuming a static, higher cost of debt and in turn a higher WACC used to discount back to present a given company’s cash flows (therefore lowering future cash flows), implicitly assumes that said company will never increase operating income above the 30% interest deductibility threshold into perpetuity. While this may be a reasonable enough assumption for some companies, for most companies it’s not. The solution here is to treat the WACC calculation as a dynamic one, reassessed and recalculated annually within one’s DCF model, rather than a static constant that is calculated based on today’s capital structure. Failing to adjust the WACC annually based on the dynamics of an evolving capital structure and cash flow profile will lead to significant errors in determining intrinsic values of a project and companies, and thus sub-optimized decisions and outcomes. In summary, here’s what we know: Interest rates will rise from historic lows, and interest on corporate debt will no longer be fully deductible. Managers and investment professionals must thus change how cash flow and WACC are understood, or risk undervaluing/overvaluing companies or underestimating potential solvency issues. Unfortunately, there isn’t a one-size-fits-all solution for all companies to maximize shareholder value post tax-reform. However, the companies that can look at their operating structure and capital structure holistically and adapt have the greatest potential to enhance shareholder value and generate above-market returns going forward. Analysts, portfolio managers, and corporate managers also need to become well-versed in the new effects of the tax law, and fast–your tax advisor can only be the scapegoat for so long. As previously discussed, we utilize the WACC to discount free cash flows to determine the intrinsic values of companies or projects. In determining intrinsic value under the DCF method, we also utilize a terminal value, defined as the present value of all future cash flows, into perpetuity, discounted back once a company has achieved a stable growth rate. The terminal value, just like the time-bound discounted free cash flows, must be discounted at the WACC. As of December 22, 2017, the marginal corporate income tax rate for US corporations is 21%. What is a company’s capital structure? The capital structure is the combination of debt and equity a firm utilizes to fund its operations and growth. Debt typically comes as outstanding revolving facilities, term loans, bonds or long-term notes while equity typically comes as common stock, preferred stock, or retained earnings. Why is capital structure important to a company? A company’s capital structure determines its required rate of return. Selecting the optimal capital structure will reduce the required rate of return and optimize value.